SINGAPORE, Oct 25, 2017 - (ACN Newswire) - Astaka Holdings Limited (SGX:42S) and Hatten Land Limited (SGX:PH0), two property developers benefiting from major infrastructure developments in Malaysia, held investor presentations today at a seminar organised by the Singapore Exchange ('SGX') and regional investor relations firm WeR1 Group ('WeR1'). Both companies, which are listed on the Catalist Board of the SGX, presented their investment merits to more than 150 fund managers, analysts and corporate leaders at the 'Beyond Klang Valley' investment seminar at the SGX Auditorium in the heart of Singapore's business district. Each is positioned to tap new opportunities arising from major infrastructure developments such as the Singapore-Kuala Lumpur High-Speed Rail, the East Coast Rail Link, new highways and port upgrades that are transforming peninsular Malaysia, accelerating urbanisation and opening up new investment opportunities in the real estate sector. Astaka, an integrated property developer, is developing two projects in Johor Bahru: One Bukit Senyum, a RM5.4 billion (S$1.7 billion) 11.85-acre project that is slated to be Johor's new administrative and commercial hub; as well as a 363-acre strata township, Bukit Pelali, near the Pengerang Integrated Petroleum Complex. Hatten Land is a leading property developer in the historical city of Melaka, where it has five integrated mixed-used projects and one retail mall with a total gross floor area of approximately 9.6 million square feet. These projects are expected to benefit significantly from activities in Malaysia related to China's Belt and Road Initiative. Astaka and Hatten Land were listed on SGX in November 2015 and February 2017, respectively, after each completed a reverse takeover. Mr. Mohamed Nasser Ismail, Head of Equity Capital Market (SME) and Head of Capital Market Development, SGX, said: "Today's investment forum has helped to raise awareness about the slew of mega infrastructure projects in Malaysia, and opportunities available to companies in the sector. We are encouraged that our Catalist listed companies such as Astaka Holdings and Hatten Land, both with substantial assets, operations and business in Malaysia, stand to benefit from these major developments. Dato' Zamani bin Kasim, Executive Director and Chief Executive Officer, Astaka, said: "I have witnessed Johor's rapid transformation since the unveiling of the Iskandar Malaysia Comprehensive Development plan 10 years ago. The State is making the change into an economic powerhouse of Malaysia and this presents a wide range of opportunities for all sectors. Astaka is poised to benefit from this transformation as there will be a need for new properties in strategic locations." Dato' Colin Tan, Executive Chairman and Managing Director, Hatten Land, said: "Hatten Land has an established track record and reputation as one of the top developers in Melaka. Since 2006, we have witnessed the state progress rapidly towards becoming an attractive destination for work and play. There are many investment opportunities in the state and the Group has only unlocked the tip of the iceberg." Mr. Lai Kwok Kin, Founder and Group Managing Director of the WeR1 Group, said, "Malaysia is witnessing a significant wave of infrastructure development that will have a wide-ranging impact on the economy, the urban landscape and the real estate sector. 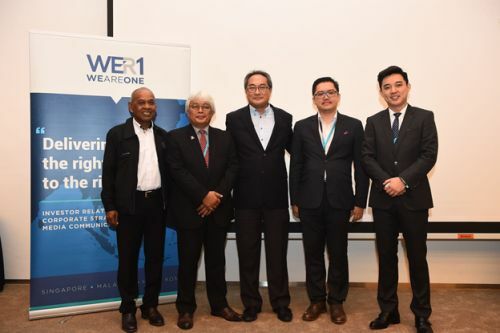 WeR1 is honoured to partner the Singapore Exchange in hosting senior executives from Johor and Melaka, as well as from Astaka Holdings and Hatten Land, for this seminar to update Singapore's investment community."